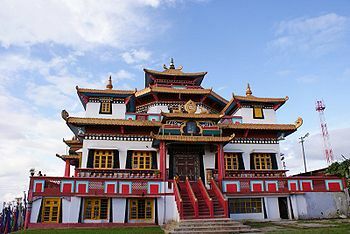 Zangdokpalri Monastery is a Nyingma monastery established by Dudjom Rinpoche in Kalimpong, West Bengal, India, as early as 1946. Before the political events in Tibet in the 1950’s, Kalimpong, a north-eastern city of India, close to the Sikkim border, was a prosperous city and a key milestone for pilgrims and merchants on the road to Lhasa. The monastery was built by Dudjom Rinpoche in 1946, during one of his early stays in India. The monastery is located atop Durpin Hill, one of the two hills of the town, and oversees the city with a breathtaking view. The architecture is modeled on the palace of Guru Rinpoche in Zangdokpalri. The monastery houses many rare scriptures that were brought into India after the invasion of Tibet in 1959. The monastery was consecrated by the Dalai Lama in 1976. The shedra, founded in 1983, has approximately 60 students. The monastery is the residence of Lama Chime Rinpoche, a senior student of Dudjom Rinpoche. Zangdokpalri Monastery is now run since 2009 by a young tulku, Shingdrup Rinpoche. ↑ The monastery is popularly known as “The Lava Monastery”.